Ever find yourself swamped with tons of images and don't know what to do? Since Spring is now here, it's the perfect time to get all those beautiful pictures in nice folders. Although this task isn't always an easy one. I've had a problem with organization and locating images for a while now, but I figured out a colorful and vibrant way to lay out my folders. 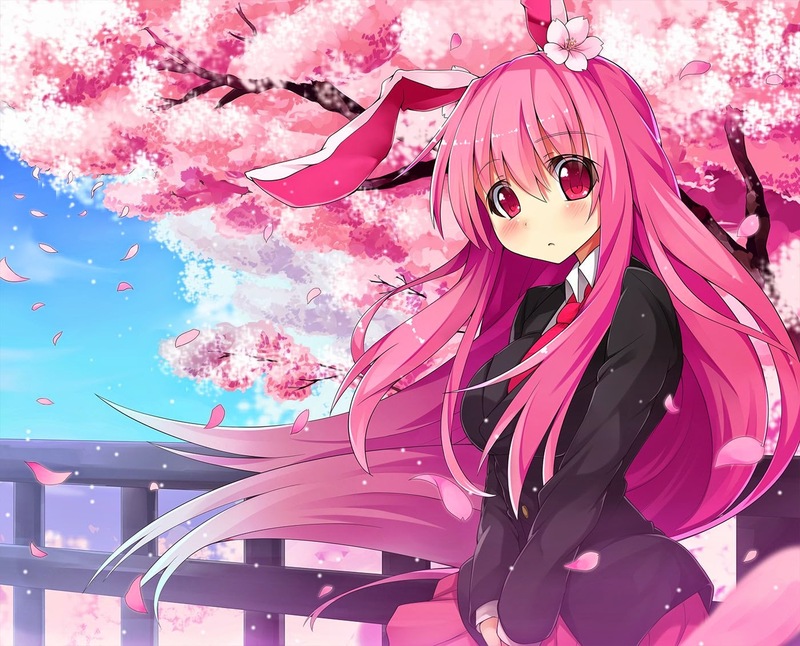 Today, I'd like to share my way of organizing anime images and creating an anime-styled folder. 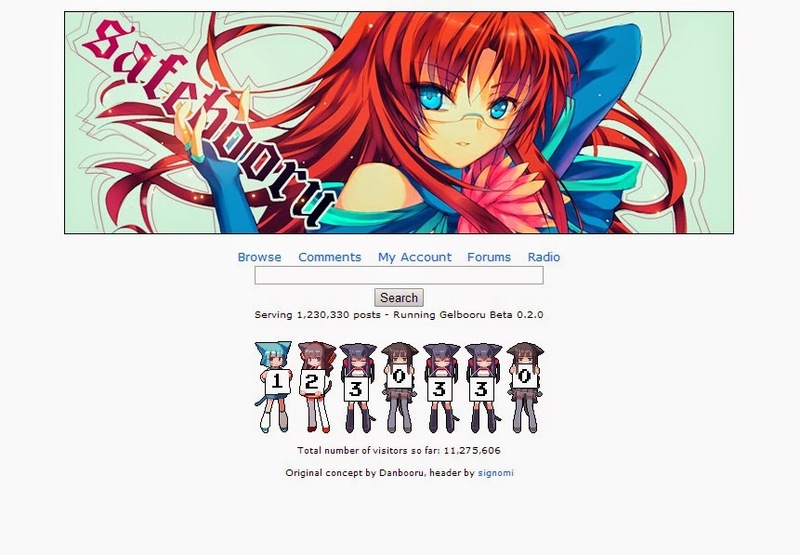 Please keep reading if this interests you, and if you're lacking images, check out my many anime-based image posts! With that being said, let's begin! A layered organization scheme is very useful for art gallery folders or anime series folder where there's a lot of categories or characters. When gathering images, I tend to browse websites such as Pixiv. 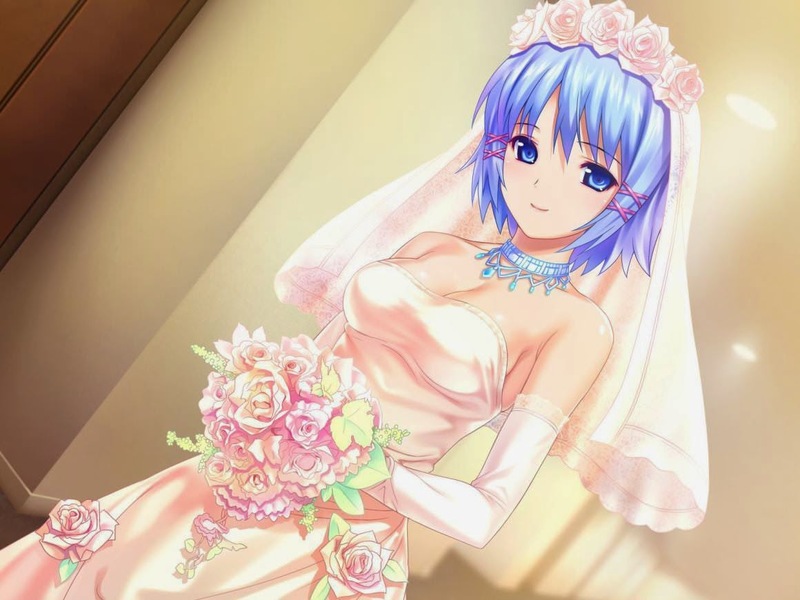 I find that Pixiv provides images that aren't found in other areas, as they're uploaded directly by the artist. 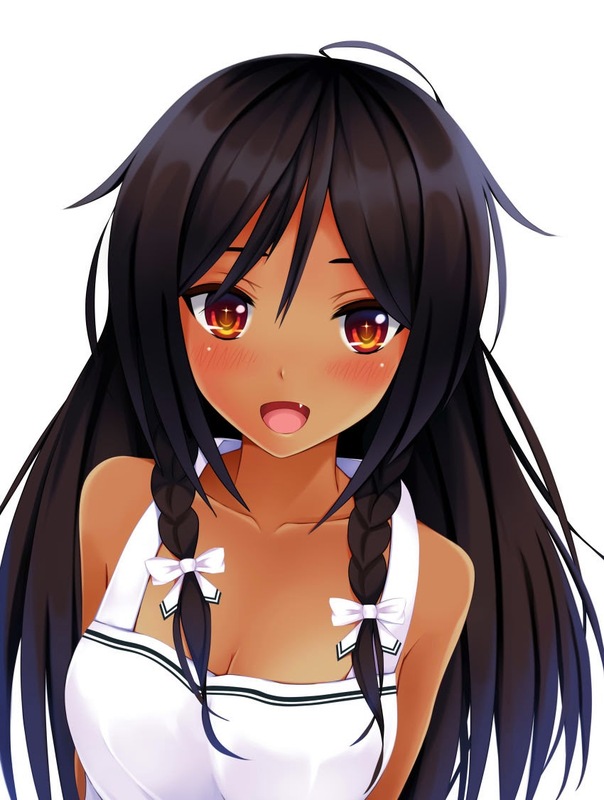 Websites such as Yande.re or Danbooru, are nice websites for high quality art, since most of these images are selected by the community. When browsing these types of sites I make use of the handy Image Grabber I mentioned in a previous post. For most cases of file naming, I tend to stick to the simple character name + artist name + a unique id number. (For instance: cynthia (fire emblem).junkpuyo.a74d397 would be a good file name.) This helps avoid duplicates but allows for easy searching in folders. This is also useful if you're the type of person who prefers a well laid-out single folder in contrast to multiple folders for each character. So yes, multiple folders are very important to have, but they're also very important to name correctly. What should you name them you ask? Well that's totally up to you. That's the basis of my organization scheme. It's pretty simple right? Of course, I'm a visual person so this isn't enough for me. The simple folder icons just don't cut it. 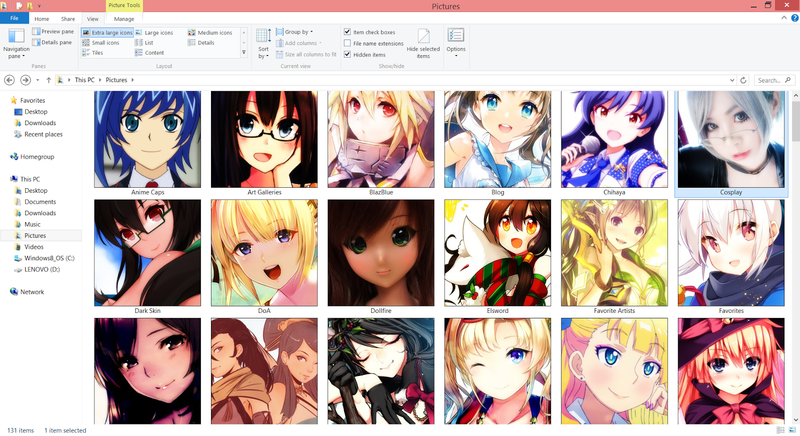 So I decided to add my own personal spin to organization...anime folder icons! These kind of icons do three specific things for me. They allow me to browse my folders without the need of troublesome text. They give me a way to make my computer feel less plain, and most importantly, having them there makes me feel good inside! Once you'e downloaded, saved, or created your icon, you can change the icon for a folder by right clicking and going to properties. Afterwards, navigate to the customize tab and click "change icon." How do you accomplish this? It's as simple as changing the folder icon. All you need to do is right click the folder and navigate to properties. Once you go there, you just need to access the customize tab and click "Change Icon." 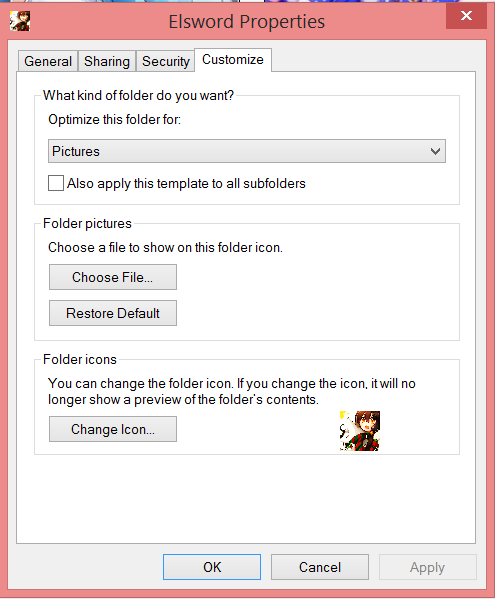 After accomplishing this you can change any folder you desire to an icon you've created or downloaded. If you wish to take this simplification a bit further, feel free to remove folder names completely, relying solely on image icons to navigate. This can be done by creating a new folder (or renaming a previously created one) holding the alt key down + typing 255. This blanks out the folder name leaving just the icon. Perfect for those who like a minimalist style. Save images with a specific name, such as the character name + artist name and a unique id number. This can easily be accomplished by using the Image Grabber. When collecting images of many characters from a sole series, put them all in one folder using the anime as the title. Split the characters into separate character folders within. Add folder icons to make searching easier, or to make your folders more stylish. The PSD file for my icon layout can be found here. 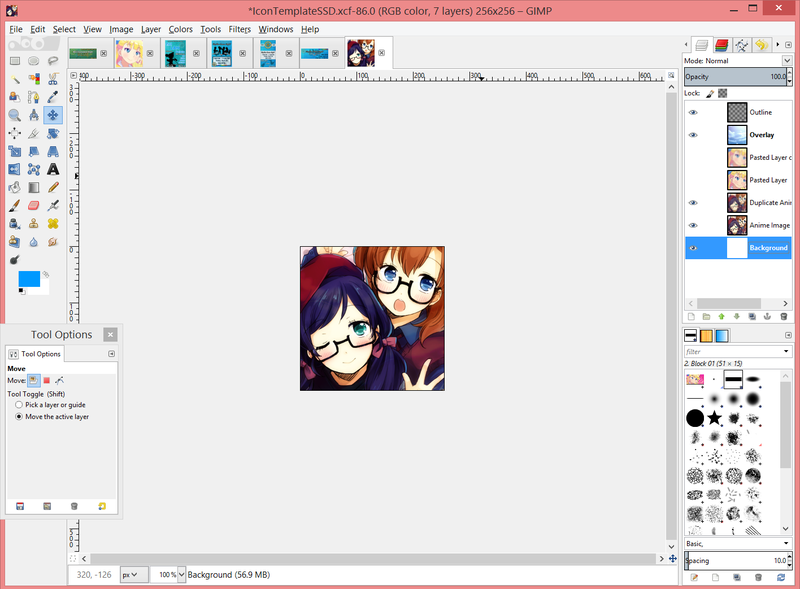 Use GIMP or Photoshop to add a picture of your choosing, then save it as a .ico file. To make a more minimalist layout, remove names from your folders while holding the alt key down and typing 255 into the folder name. That's all there is! 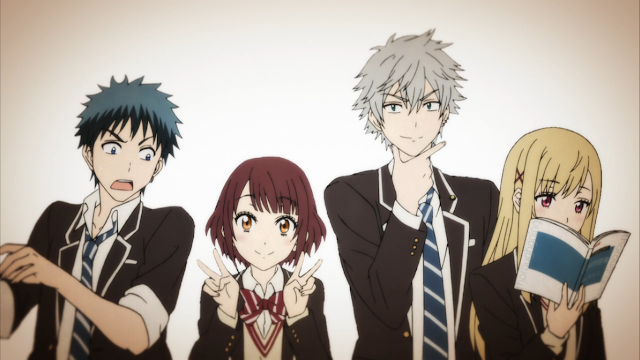 If you have any questions or concerns about this anime image organization, please let me know in the comments below and I will definitely help you out! Great article! Sometimes when you are raiding the interwebz for images, you might get overzealous and right-click them all! But after a couple of years without any proper structure, it can get quite intimidating sorting theme all out. I think I will do something similar to your post, but for music organization. Again, great job Rekari! Thank you for commenting! Apologies for not responding as of late. I've been forced to focus more on real life events for the time being. Definitely. when I started I used to just throw everything into a single folder, and boy was that a bad idea. I think music organization in this way would be pretty cool. I've actually seen people do it before and I'm totally jealous of their layout. I don't have a lot of music on my computer so I've never gotten the opportunity to try that out, but would love to some day.